When Nike took over as the official supplier of NBA jerseys and apparel last year they introduced four different sets of uniforms that can be worn at any time. There are the Association (white), Icon (color), Statement and City editions. The City jerseys can change on an annual basis, and ten teams have already officially revealed their new designs for this current season. 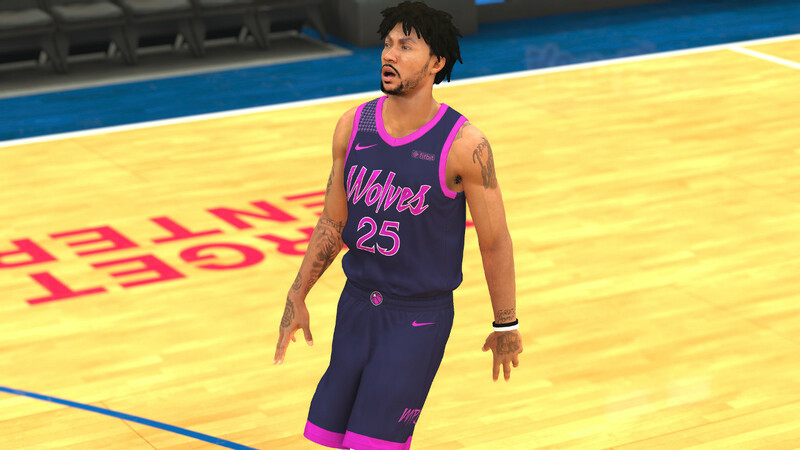 Those teams have now also received the new uniforms through an update in NBA 2K19. Some of the favorites from the group include the Timberwolves design inspired by Prince, Thunder honoring Native American heritage, 76ers with the Rocky sweatsuit look, and the Nets incorporating the iconic style of Notorious B.I.G. See screenshots of the full set of new unis here. The Hornets have revealed theirs but for some unknown reason it has yet to be added. The Suns, Heat, and Jazz also have their City jerseys available for use though they are carryover designs from last season. Because these uniforms are tied to official rosters they won’t appear in any ongoing MyLeague, MyGM, or MyCareers or previously created custom roster. They can only be utilized if starting a brand new save with the updated roster. It’s unclear whether they will be patched in at a later date to allow for their usage in modes that began prior to their additions.